Juneberry Lane: Neapolitan Dessert Delights . 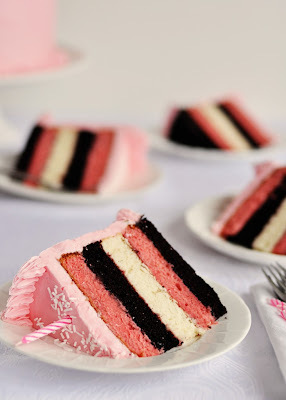 . .
Well, since we have been inspired by all things Neapolitan in the past few weeks (remember Nicole's fabulous party over at Tradewind Tiaras?) and most importantly, since I have finally learned to spell the word, I thought a few delicious recipes might be the perfect way to take us into the weekend. Neapolitan ice cream was named in the late 19th century as a reflection of its presumed origins in the cuisine of the Italian city of Naples, and the many Neapolitan immigrants who brought their expertise in frozen desserts with them to the United States. 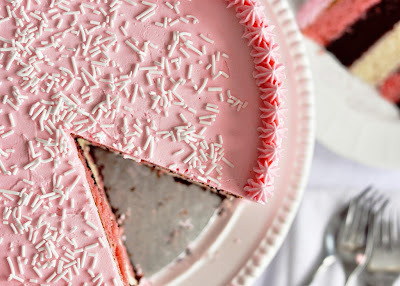 Spumoni was introduced to the United States in the 1870s as Neapolitan-style ice cream. Early recipes used a variety of flavors; however the number of three molded together was a common denominator. As chocolate, vanilla, & strawberry were the three favorite flavors over in the United States, this combination quickly became the standard...and judging from how yummy & pretty those three tasty flavors meld together, I am so very happy that it did . 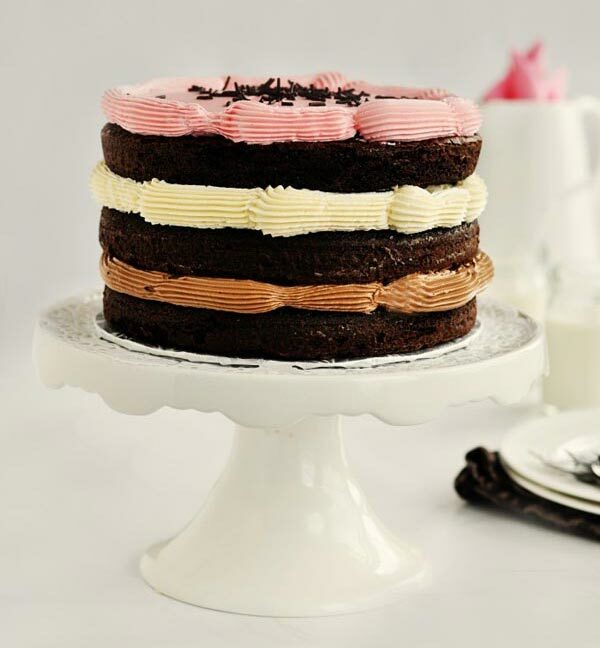 . .
3 layers of rich Southern Devil’s Food Cake stacked between fluffy Neapolitan flavoured Swiss Meringue Buttercreams: Belgian Chocolate, Vanilla, and Strawberry, and topped with pure dark chocolate sprinkles from Holland. Or check out this fantastic Neapolitan Five Layer Birthday Cake with Strawberry Frosting . . .
And since we're on the subject...why not make some cupcakes too? 1. Line your cupcake pan with your cupcake liners. I used my favorite chocolate brown liners. 2. In two seperate bowls, follow your individual vanilla and chocolate cake recipes to make the cake batter. 3. First, fill your cupcake liners with 2 tablespoons of vanilla cake mix. Next, add 2 tablespoons of chocolate cake mix on top of the vanilla. 4. Bake cupcakes according to your own indiviual recipe. I used a store bought cake mix, which called for 20 mintues at 350 degrees. Remember to rotate your cupcakes half way through your baking time. 5. 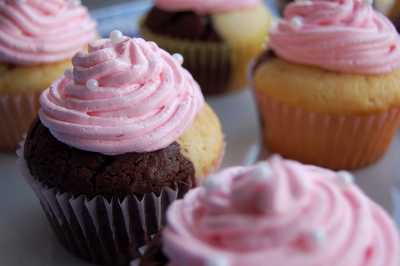 While your cupcakes are baking you can make your Simple Buttercream recipe. We used 2 drops of the Americolor Soft Gel Paste in Soft Pink to get the pretty pink color. Aren't they just fantastic? Make sure to let your cupcakes cool completly before decorating. 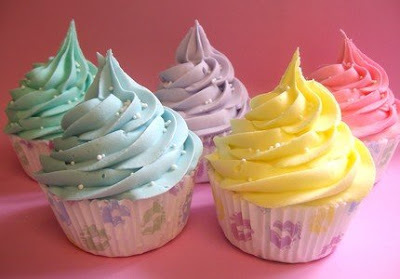 Love the look of these gorgeous, fluffy cupcakes but not sure if you have what it takes to make it happen on your own? No fear, here are a few simple steps to achieving that perfect cloud of frosting froth . . . 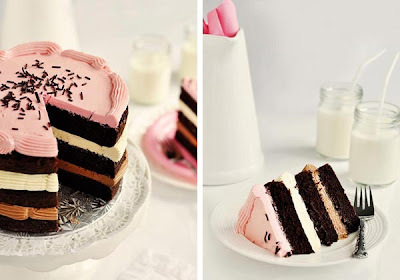 Using a piping bag and decorating tip is super easy. 1. 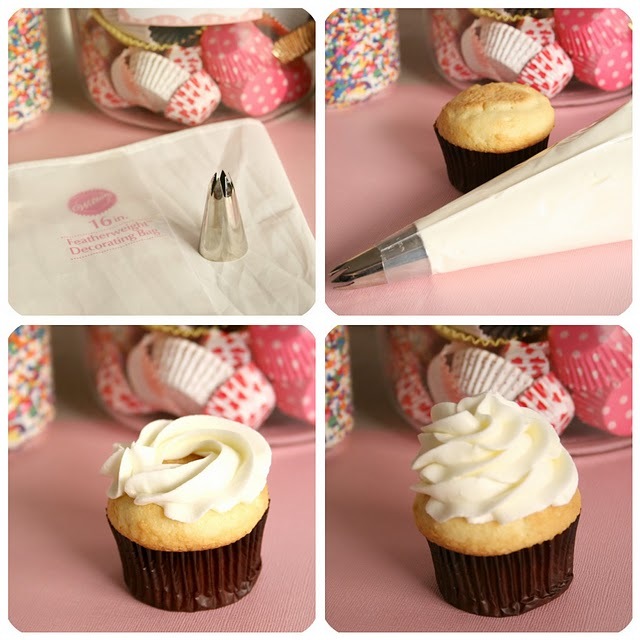 Place your decorating tip inside your piping bag. If using a disposable bag, you will need to cut the tip of your bag. Make sure not too cut to much, you don't want your tip to fall through. 2. Fill your piping bag with frosting and twist the top of the bag. This will create pressure so you will have an even flow of frosting. 3. Place your cupcake on a flat surface. Hold the top of your piping bag between your thumb and forefinger and the bottom of the bag with your other hand. 4. 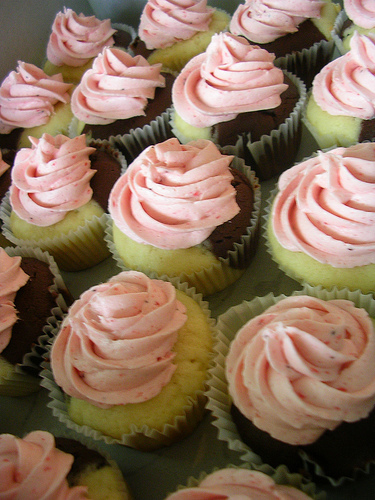 Start on the outside of your cupcake and in a clockwise motion pipe your frosting. 5. 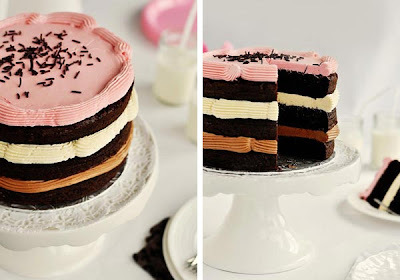 If you're building your frosting upwards (as shown in the above photo) continue piping layers of frosting until a yummy frosting peak is created.